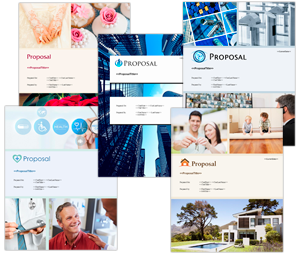 Every Proposal Pack and Professional bundle includes hundreds of completed samples of proposals, business plans and other documents created with Proposal Kit. The Proposal Pack Wizard software can create editable Word versions of those samples in the visual design theme of your choice or branded to your own company design theme. Watch this video to see how you can quickly create your own custom proposal based on an existing sample. In this video we're going to show you how to reuse one of our sample proposals as your own starting point for your own proposal. The Proposal Packs and Proposal Kit Professional bundle all include a large library of hundreds of completed sample proposals. Those samples are made up of thousands of pages of completed material. That's in addition to the thousands of pages of fill in the blank templates that you can customize make your proposals from. So in this video we're going to show you how to reuse a sample. Now we also have hundreds of visual design themes. Each one of our samples was rendered in a specific design theme by somebody in the past. But you might want to recreate that sample in a different design theme. Our Proposal Pack Wizard software is designed to do that for you. So let's say we purchased a specific design theme out of all the ones we have available. We have hundreds on our website. We're going to start with Proposal Pack Global #4. So let's say someone purchased this one design theme. Now the system works no matter what design theme you purchased. So let's say we purchased this, downloaded it, got it all installed in our Wizard software. Other videos will cover all this kind of setup for the Wizard software and the packs. So we're going to assume you already have everything set up and installed. So we've run the Wizard. You'll see we have our Global #4 design theme. We're going to create a Document Project. We'll pick the documents. This Pick Documents screen lets you select all the chapters that are going to go into your document. It also has a tab here called View Samples. This is how we can get to the hundreds of samples that are already included in Proposal Pack. So let's say we're going to scroll down and we kind of found one already that we liked. It's called the Business Services and Consulting Sample. All these are in alphabetical order. We're just going to select that sample from the drop down. Now we can view the PDF version of the sample by clicking this. Now the samples are all rendered PDFs. You cannot edit the PDFs directly because they are they finished and rendered versions of someone else's work. Now the first page of each sample will show you the list of chapters that were selected, the design theme that sample was created in. You can just scroll down. You'll see this consulting proposal was created in the Proposal Pack Business #2 design theme. This orange and green design. But you'll notice the text, the filled in actual content, like the Cover Letter, Non-disclosure, Executive Summary and so on. You'll see this has a specific company's name in it and so on. Now the Wizard will be able to import all of this actual text into your design theme. But it'll also replace the contact information like the company name, personal names, phone numbers and so on. It'll replace those with yours when it builds your version of the sample. So this is the PDF, but we're going to build our own version editable in Word, but in a different design theme. All we have to do to do that is click this Import Content from Selected Sample button. We have the sample selected in the drop-down up here and you see our project is loaded with the same set of chapters that the sample was created with and we can also customize this list of chapters when we built our own editable version. We could drop out some of these chapters. We can add new chapters in from the library of thousands of templates. We're just going to stick with the exact list that the sample was created with. Now you see this little checkbox. That checkbox means that when we build our document the Wizard will import the content, the text of that sample, into our generated version. So click the Ok, Use Selected Templates button. And we'll have our own information in the Company Data screen and we'll fill in the Client Data screen. Now that we have the template selected we're set to import the content from the sample, the Company Data and Client Data information is filled in. We can click the Ok, Save Project button. Click yes to any messages. Now you just sit back and wait for the Wizard to generate the document. Ok, now the Wizard has generated our custom document. Now this one is using an Expert level feature where it has an Excel spreadsheet where the sample calculations and line items were also used. And I'll show you where those will show up in the document later. You can see the monthly, miscellaneous costs and totals. Contact information from the sample has been replaced with the data that we had entered in our Company Data and Client Data screens. You can see right here the cost summary has pulled in the calculations and line items from the Excel spreadsheet. Now if you're using the Novice Wizard you can just enter your costs right into the table manually without using the Excel linked spreadsheets. And the rest of the content from the sample has all been pulled in. And this gives us a quick way to create our own proposal using the design theme of our choice and having some pre-written text that we can start with. So at this point it's just basic word processing to finish editing this template.